Pop-Up Prairie Town is the 14th course of Episode 1 in Captain Toad: Treasure Tracker. 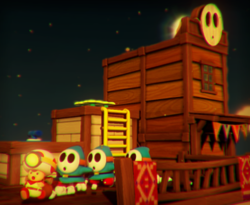 This level takes place in a Western town populated by Shy Guys. Captain Toad starts near a Pull Switch that raises a platform when pulled. From here, he has to raise more platforms and traverse Propeller Platform routes (Lift routes in the Switch version) to reach the Power Star. Super Gem 1: Under the first platform raised by a Pull Switch. Super Gem 2: On a ledge accessible only by a Propeller Platform (a Lift in the Nintendo Switch version). Super Gem 3: At the bottom of the stairway under a Pull Switch-raised platform. In the Shy Guy mask on a building, an 8-bit Luigi can found in the mask. It was removed from the Switch and 3DS versions of the game. This page was last edited on April 15, 2019, at 13:30.